To mark Go Skateboarding Day, a bunch of skateboardings finest came along as instructors, including Lacey Baker, Eliana Sosco, Jessica Florencio, Mimi Knoop, Leticia Bufoni and Cara-Beth Burnside to a Girl’s “Shreducation” Day at TransWorld Skatepark hosted by MAHIA.com. There were over 40 girrls of different ages and abilities looking to learn and who enjoyed a fun day building up their skills. 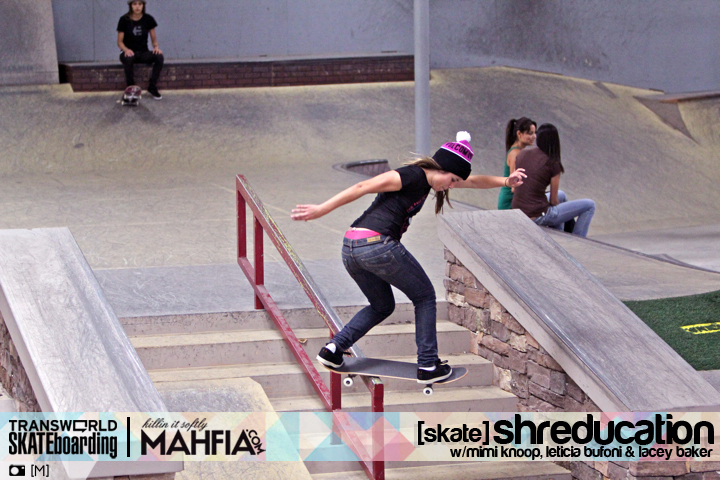 Later on, the pro ladies threw down some moves of their own in a demo session. Check out the full picture gallery of 76 pictures over at Transworld here – awesome! Looks like it was a wonderful day and really supportive to the girls scene.